Larry OG Kush by the Cali Connection Marijuana Seedbank. Based mainly on genetics from the Californian Coast, USA. These guys marry the finest marijuana strains with their favorite OG Kush legendary strain. Larry OG Kush is no exception to this rule, using the fames Larry cutting and crossing with a F3 OG KUSH hybrid the boys have again produced some perfect pot seeds. Ideal for the ever growing, cannabis seed collectors market. 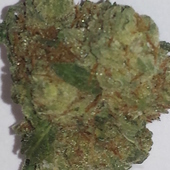 a great strain for relaxing without couch lock, with a great taste and odor. Whats up Larry! Larry OG is my man. Every time I hit him up i'm as blazed as the surface of the sun! Can't keep me from rolling jays with this stuff. Taste like one of the best OGs i've ever tried. A great strain!